Ridley Scott's fourth film Legend is known for its notorious struggles between the studio and the director after lukewarm previews. The ambitious fantasy was chopped from its original 113-minute cut down to 85 minutes for the U.S. version. The original score by Jerry Goldsmith was replaced by a more contemporary one from the German electronic band Tangerine Dream. Although it was shot in 1982, the release didn't happen until 1986. Stars Tom Cruise and Mia Sara had grown up and were moving on to bigger projects by that point. Legend failed at the box office but has remained popular with some genre fans over the years. The original Director's Cut is widely available on DVD and Blu-ray, and I watched this version for this post. 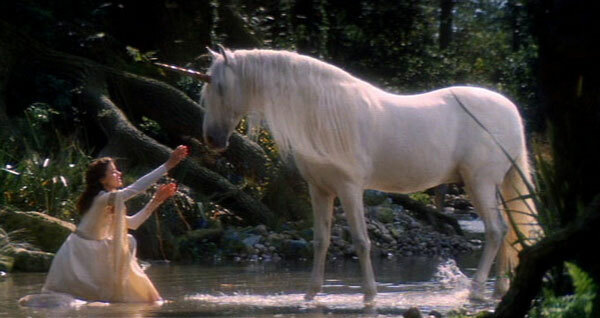 The evil Darkness (Tim Curry) plans to plunge the world into eternal night by killing the unicorns that protect the land. Princess Lily (Mia Sara) and forest boy Jack (Tom Cruise) are enjoying a day in the woods and are inadvertently thrown into an adventure to save the world. 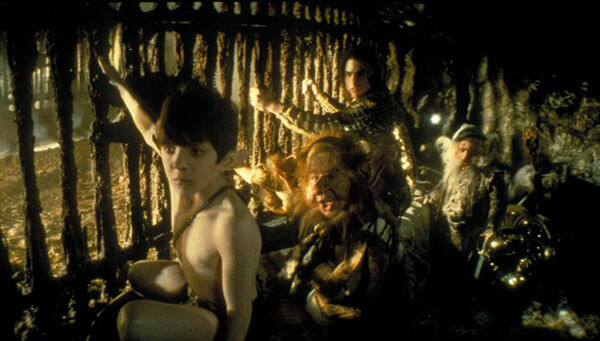 After Lily is captured by the demon, Jack joins a group of fairies and dwarves to try save her and the entire land. Darkness wants Lily to be his bride, so Jack has a personal stake in the fight. Battling a variety of monsters along the way, the unlikely adventurers have little time to rescue Lily and the unicorn before Darkness reigns forever. Would I want to live in this fantasy world? Who wouldn't love a place of unicorns, singing, and nasty monsters? Okay, maybe that's not the best selling point. Although much of this world is dark and bleak, the forest is attractive. The art direction is one of the top selling points for this movie. The thirty million dollar budget (very high for that time period) definitely appears on the screen, particularly in the lair of Darkness. The question is whether all this investment leads to a gripping story. Certain sets are so dark that they're nearly incomprehensible, particularly the prison where Jack and his pals are trapped. There are nasty happenings with the monsters appear to be cooking people in a giant stew pot. While this idea is brilliant in a nihilistic way, the scene doesn't pack the punch that it should because it's such a muddled environment. When you consider the environment created by Scott and Writer William Hjortsberg (Angel Heart), the characters fit inside this realm. However, they're also bland and never stretch beyond the expected roles. Tom Cruise is surprisingly flat in this early performance and isn't helped by laughable dialogue. Mia Sara is a bit sharper and gets the chance to have some fun when Lily's tempted by the dark side. The ridiculous black outfit helps to make it a memorable scene. 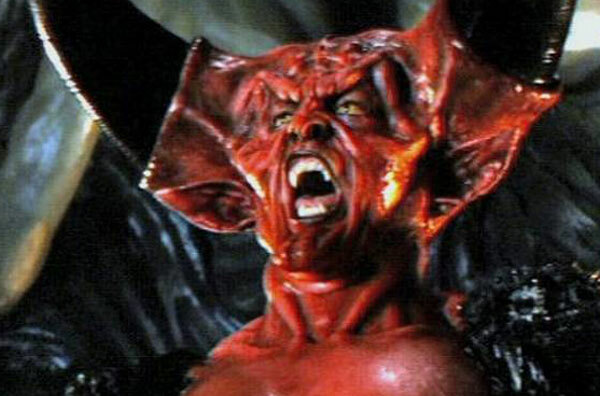 Tim Curry has the standout role as Darkness, though he doesn't physically appear until the second hour. The amount of makeup required to transform Curry into the devilish villain is remarkable. Legend received an Oscar nomination for Best Make-up, and the main reason is for the visually stunning Darkness. Curry has fun as the over-the-top baddie, but it's not enough to compensate for the uninteresting heroes. How are the special effects? Legend includes some impressive special effects, particularly when you consider the time period. Most of the images appear on a smaller scale than the massive locations presented by recent franchises like the Lord of the Rings and Harry Potter films. Most of this difference is due to the capabilities of the time, which exist in another stratosphere today. 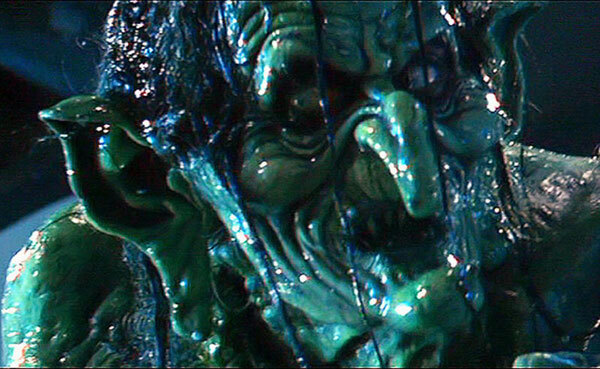 Like I mentioned earlier, the effects do get too dark at times, even on a remastered DVD transfer. Another issue are the fairies, which are painfully generic. Gump (David Bennett) looks like a pre-teen boy with silly ears using the voice of an old lady. His first appearance is very awkward, especially combined with Cruise's stilted performance. Despite the hokey moments, the effects generally work when you consider the early '80s technology. The first act is the most interesting part of Legend because there are so many odd moments. Lily belts out several tunes while meeting the unicorns, and it's not enchanting. She appears to love Jack but makes him fetch a ring from a pond to prove it. Once Darkness takes over and the land becomes ice, the scenes afterwards are the most chilling. Lily's discovery of her frozen friends in their house is effective and reminds us that Scott knows what he's doing. This eerie tone disappears in the bombastic final act, which feels like your standard "good versus evil" tale. For a PG movie, there are some pretty dark moments, especially during the seduction attempts by Darkness with the teenage Mia. It never goes too far, but the menace beneath the surface is surprising for a family movie. Does the director build an original and creative environment? Ridley Scott has directed classics like Alien, but he's also the man behind 1492: Conquest of Paradise and Hannibal. Legend shows his talent, though it feels like a passion project gone wrong. There are clever moments, but the environment is too generic. An exception is the brief appearance of Meg Mucklebones, who's actually played by Robert Picardo from Star Trek: Voyager. The hideous creature has an energy that's missing from much of this story. I'm a fan of fantasy epics, even when they don't work, so I applaud Scott's attempt. The Director's Cut is probably smoother than the theatrical version, but it remains inconsistent and lacks the touches to become a classic fantasy film. Next week, I check out the Black Fortress and hang out on the planet of Krull. It's too bad, because he really finds an ethereal beauty every once in a while, but otherwise just can't seem to connect with the characters or story. Danny, it's really surprising that a director like Ridley Scott (especially in his prime) would deliver a movie that's so generic. The characters are the big issue, especially Jack, who's really dull. I don't think it's a complete failure, but it's pretty forgettable. Thanks! I have no comment on this movie, as I haven't seen it, but I just thought I'd comment on the title of the piece, I really thought this was going to be a marathon of every 'Once Upon a Time' movie. Imagine! I think there might be more. Do it, do it! Colin, I've obviously failed in the clever titles department with this marathon. I like the way you're thinking! Thanks! For what it's worth, I recently did a post on Lagaan: Once Upon a Time in India. I then put Once Upon a Time in China in my Netflix queue for the express purpose of seeing it, so that I could combine it with America, the West, and Mexico. I haven't seen the latter two you mentioned. There's also a in Mumbai one. I've only seen this movie one time, and the story of the time I saw it is a total non-sequitur about one of the first times I ever got drunk, in Rhode Island, over Thanksgiving weekend, with my brother (who's 12 years older than me). The fact that I went to a story about my brother rather than any sort of comment about the movie speaks volumes about my recall of the movie. Nice! That's a lot more interesting than the movie (and this review). I saw this movie when it came to video, so it's probably been 25 years since I saw it the one time. That means I must have seen the theatrical version. I remember that I had heard that it was supposed to be bad, but I didn't see what the fuss was about. While I didn't think it was that great, I thought it was reasonably entertaining. Of course, the fact that I've never bothered to re-watch it speaks volumes.